The NX Room Controller is the central component of the NX room control solution. Used individually or in combination with other NX Room Controllers, the NX Room Controller provides a complete standalone room control solution that can be networked for facility wide lighting control. The NX Room Controller uses SmartPORT technology to automatically configure occupancy sensors and manual control switches to provide an energy efficient room control solution without the need for any programming or commissioning. When devices are plugged into one of the NX Room Controllers SmartPORTs, the NX Room Controller automatically and intelligently configures the connected devices for operation. Changes may be made to the automatic configurations at any time using NX Bluetooth enabled Apps or when networked through the NX Area Controller. 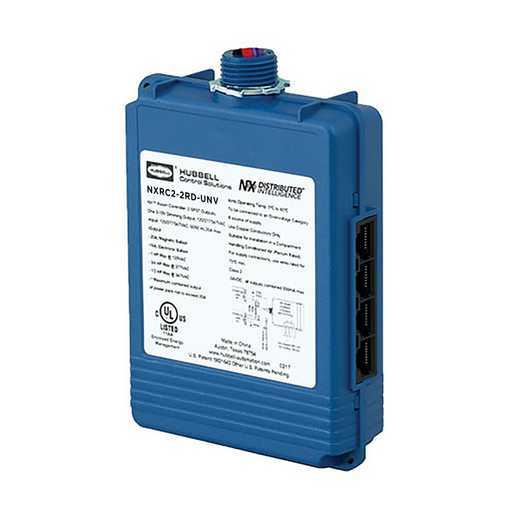 NX Room Controllers are available with one or two independently controlled relays for On/Off and Bi-Level control. Dimming versions are available with one or two 0-10V control signal outputs for full range dimming control of dimmable ballasts and LED drivers.